Much like Castaway and Tom Hanks’ obsession with Wilson, there are things we can honestly say we don’t think we could live without. Luckily for those paperbacks, they don’t require a charge and their only fault is not being waterproof. 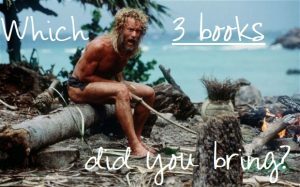 So, if you had to only pick 3, which books (all-time) matter the most to you? Re-readable qualities…Characters you can’t live without…Narration that soars and exposition that is just right.